In 1963, the Royal Air Force were looking for a new supersonic advanced trainer aircraft; a type that would replace the Gnat and eventually the Hunter in the trainer roles from 1970 onwards. This would save on the costs of operating two increasingly outdated types and offer more realistic training for pilots destined for heavier and faster types such as the Lightning and TSR2. Air Staff Target 362 was drawn up to initiate a study of suitable designs and was issued to the varied collection of aircraft manufacturers still in existence at the time - Hunting, Folland, English Electric and the Hawker-Siddeley group. AST 362 suggested that if suitable weapons capability was added, the aircraft could even carry out a limited counter-insurgency role, but it really was primarily to be a high performance trainer. Seating would be in tandem, with provision for some aircraft to give up the rear instructor position and replace it with a navigator position so that navigators could be trained too. Strict weight limits and impressive supersonic and low level endurance were called for. However, the sheer cost of existing advanced projects (P.1154, TSR2 and AW.681) and the confluence of their expected in-service dates meant that the RAF was looking at footing a huge bill all at once, or delaying the acquisition of the new trainer for some time. Coincidentally, the Armée de l'Air (French Air Force) were also in need of some new aircraft. In their case the more pressing need was for an affordable strike aircraft, as the Mirage IIIV (a VTOL version of the Mirage III, and similar in many ways to the RAF's P.1154 project) was turning out to be an expensive proposition. They also had a need for a new trainer to replace the increasingly outdated Magister, and these two requirements merged to become ECAT (Ecole de Combat et d'Appui Tactique - Tactical Combat Support Trainer). The needs of the RAF and the AdA were, it seemed, converging nicely just when both countries were finding it difficult to afford continued military aircraft development. British industry responded to AST362 with various propositions, mostly using variable sweep designs (which the type had no actual need for, but the RAF seemed happy to go along with it as this would give the companies involved "invaluable technological expertise in this field"!). With the RAF originally wanting the type in service by 1970, naturally all of the companies claimed their designs would have ridiculously short gestation periods. By mid 1964 the RAF had realise that their only serious chance of getting their new trainer would be to team up with the French. French cooperation was sealed with the signing of a Memorandum of Understanding to work together on the production of an aircraft to meet both the AST362 and ECAT needs. However, by mid 1965, the financial situation in Britain had led to the cancellation of all three of the RAF's new strike and transport aircraft and suddenly the RAF were left with a project to build a new trainer for types that no longer existed. The French had already run a competition to decide on a home-grown type to meet ECAT, and selected the Breguet BR.121. When the deal to cooperate was signed, Britain had agreed that the design would continue to be based on the BR.121. The questions of variable sweep (and loss of the new strike jets) was settled by the creation of another project (AFVG - Anglo-French Variable Geometry), more or less as a sop to BAC. Breguet would design and build the nose, centre fuselage and undercarriage of the new trainer; BAC would get the intakes, rear fuselage, wings and tail. Both companies would run identical production lines, marrying together components from the other to deliver aircraft to their respective air forces. The powerplant was to be a joint effort too, with Rolls-Royce and Turbomeca joining together to further develop the Rolls-Royce RB.172, which would be named Adour (after a French river). A joint Breguet-BAC outfit called SEPECAT (Societe Europeeene de Production de l'Avion d'Ecole de Combat et d'Appui Tactique) was formed in May 1966. After much discussion and asking for permission from Jaguar Cars, the type was given the name of Jaguar. The French did not want a top of the line "do everything" jet - TSR2 had shown the folly of that sort of requirement to anybody who cared to learn the lesson. What they did want was something lightweight, easy to maintain and rugged. They foresaw three primary aims for the new aircraft - training (75 airframes) plus tactical nuclear strike in a European war where the larger air bases could well have been destroyed, and supporting French forces overseas in a lower threat environment (a further 75 airframes). The RAF had initially planned on a buy of 150 trainers; however, with both TSR2 and P.1154 gone, the RAF were looking increasingly hard at their future light strike needs and realising that they now needed more than just advanced trainers with some secondary counter insurgency capability. The RAF's strike line-up was at this point intended to consist of American F-111s plus the AFVG for lighter strike purposes. There was concern that both F-111 and AFVG were high risk projects and with the French already planning on a strike role for the Jaguar, there was an opportunity to introduce a serious backup plan for the RAF's future strike needs - the Jaguar. The RAF's buy was accordingly increased to 200 in 1966, to consist of 110 trainers (rather than 150) and 90 new light strike/tactical support versions. However, these would be much more sophisticated than the austere strike version the French wanted. The French were not far behind in upping their order, also to 200 aircraft, this being an addition of 40 of a carrier-based version plus 10 trainers for the naval flyers. Five major variants were now on the drawing boards - Jaguar A was the French single-seat strike aircraft; a relatively basic version, with twin 30mm cannon, a twin gyro and doppler-based nav/attack system comparable to the older Mirage IV and Martel missile capability. Jaguar E was the French trainer, retaining cannons and hard points but with no nav/attack system or missiles. The RAF's initial requirement for a Jaguar B trainer was added to with the Jaguar S strike version, and the Aeronavale wanted the Jaguar M single-seat carrier variant, similar to Jaguar A but with stronger undercarriage and the addition of a laser rangefinder (which would end up retrofitted to some of their Jaguar As). The RAF's Jaguar S was to be a much more advanced aircraft than the A, with a cutting edge nav/attack system of more accuracy and complexity than the French version (and far less reliability! ), moving map display, laser range-finder and marked-target seeker (LRMTS) in the nose and a wider stores selection. The B would be almost as capable, lacking the laser nose and one cannon, but retaining much of the capability of the S apart from in-flight refuelling equipment. The RAF's requirement for supersonic performance had already required considerable redesign effort as the BR.121 was decidedly subsonic; new wings, reshaped fuselage and a higher rear cockpit were in progress, and engines with reheat would be required too. BAC were also busy almost completely re-arranging the internal layout so that while there were obvious similarities in general arrangement, the BR.121 design was soon left behind. The French were not awfully happy with this state of affairs, viewing the supersonic requirement as requiring a disproportionate amount of work, but in public at least the two partners presented a unified set of happy smiling faces. Development was not as smooth as had been hoped, with engine problems in particular slowing the whole project down. As with the TSR2, the incorporation of a new engine with a new airframe led to issues and this time there wasn't even a flying testbed to help out. To complicate matters, Breguet began talks to merge with Dassault in 1967, something that would then come to pass and would do no good to the programme's export prospects. The first prototype - E.01 - was rolled out in April 1968 and after ground trials it was dismantled and transported to Istres, from where it made its first flight on 8th September 1968. The engine problems dogged early test flights, with single seat prototype A.03 demonstrating poor engine performance by landing short of the runway in May 1969 ripping off the nose gear and damaging the nose, and E.01 being lost after an engine fire in March 1970 (the pilot shut it down, but also shut down the good engine on final approach and neglected to select manual emergency power thus losing the hydraulically powered flying controls and leaving him with no choice but to eject). The damage to A.03 and loss of E.01 slowed the development programme down significantly (and A.03 would be written off after an engine fire in 1972). The first British single seat prototype (S.06, XW560) was flown on 12th October 1969, going supersonic on its first flight, but would be destroyed on the ground in August 1972 due to an uncontained engine failure that ruptured a fuel tank. The first British two-seater (B.08, XW566) was flown on 30th August 1971 - and thankfully survived to a well-earned retirement! Test flying revealed that a significant number of changes were necessary, and production airframes would add both ventral fins and an enlarged tail fin to improve stability - this was quite an issue at the time, and a lateral autostabiliser system had to be added too. Other noticeable changes included adding perforations to the airbrakes and deleting the intake splitter plates. A lack of structural rigidity in the fuselage meant that the spine area would bend slightly under load and as this was where the control runs were, an uncommanded rudder input would result - with roll-yaw coupling, that meant pulling out of a dive could result in an unexpected roll, made worse when any stores were loaded under the wings. A compensating arrangement was installed to deal with this as part of a roll autostabiliser. The first production Jaguar A rolled off the assembly lines in May 1972, seven years after the project was begun, and the first Jaguars entered service with the AdA in June 1973, with initial squadrons being assigned primarily to the nuclear strike role. This was demonstrated in the most obvious possible manner in July 1974 when a Jaguar A dropped an 8 kiloton AN52 tactical nuclear bomb on the Mururoa Atoll. In 1970 the RAF finally abandoned the idea of using the Jaguar as a trainer for anything but training Jaguar pilots, and changed their order to consist of 165 Jaguar S and just 35 trainers, soon after giving the go-ahead to Hawker-Siddeley to build their HS.1182 project (since named Hawk) to fulfil the trainer requirement (the French would also go through a similar process, kicking off the Franco-German Alpha Jet programme to fulfil their training requirements). The RAF's first Jaguar rolled off the line in 1972, and they entered service in May 1973 with XX111 being delivered to the Jaguar OCU at RAF Lossiemouth on the 30th of the month. It was, however, to be used for ground crew training initially and the unit did not start flying until September when further airframes arrived. The first airframes were also not up to full Jaguar S spec and needed to be retrofitted to fully match the spec later on. On the French side, the Jaguar M - the carrier version - carried out trials from 1969 onwards, but the Aeronavale weren't too impressed with the speed of engine response when going round from a failed arrested landing, single engine safety, or roll response at low speeds with the flaps down. After designing and building an entirely new wing for the M to improve matters, the second set of carrier trials were cut short when it was found that the engine compressor casings were cracking under deck landing loads. 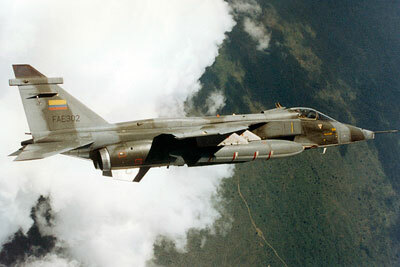 Dassault then pushed an upgrade of their existing Etendard - the Super Etendard, claiming it would be cheaper and safer. The single engine safety margin on a jet with just one engine is of course zero, but nonetheless it looked like a less risky option to the French than continued development of what appeared to be a rather unsuitable airframe, and they accordingly cancelled the Jaguar M (which then never had the new wing fitted) and ordered Super Etendards. Naturally they ended up costing rather more than expected, and numbers had to be cut to compensate. 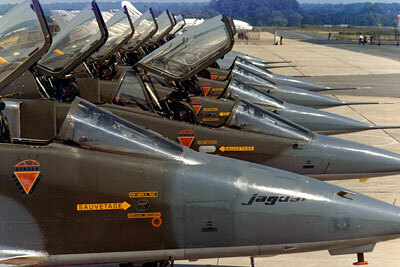 Brazilian and Argentinian interest in the Jaguar died with the cancellation of Jaguar M.
While the decision to abandon Jaguar M does appear to have been a sound one in retrospect, Dassault were accused at the time of simply preferring to get 100% of the sales income from selling their own design instead of selling a half-British aircraft. If that wasn't the case with Jaguar M, it certainly became the case with other attempts to export the Jaguar. The export version, Jaguar International, was based on the more sophisticated RAF Jaguar S (GR.1) and BAC carried out much of the extra work needed; Dassault, for their part, simply tried to scupper their partner's efforts by offering better deals on the Mirage V or F.1. In the end, useful but fairly small sales were made to Oman, Ecuador and Nigeria. 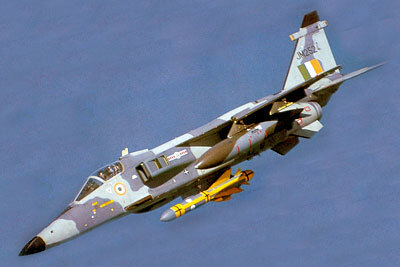 The big win was with India, which ordered 160 Jaguars, mostly to be built locally by HAL. Back to September 1974 and the Jaguar OCU became 226 OCU, taking over the number plate from the former Lightning OCU which had disbanded at Coltishall in June. Over the next few years 54 and 6 Squadron formed up on the new type and RAF Germany also became busy with no fewer than six squadrons all becoming Jaguar units (replacing Phantoms and Harriers). In the early days, the RAF's Jaguar was somewhat lacking in capability, suffering from insufficient thrust and an unreliable navigation and weapon aiming system. It could also be a demanding aircraft to fly, with a tendency to bite the unwary - or ham-fisted! With a small swept wing, departure from controlled flight at the edges of the envelope could be sudden and unforgiving. The heavier loads carried on operational missions further reduced the margins so an audio warner was in place that could be set to go off at particular critical angles of attack relating to the stores configuration. Pilots ignored it at their peril and losses in training were not uncommon. 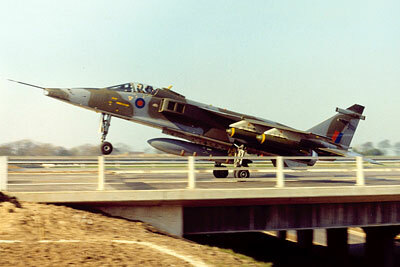 The Jaguar made the headlines in April 1975 when BAC demonstrated the use of a motorway as a runway, landing a GR.1 on the (then-nearly finished) M55, arming it with four bombs and taking off again. In service the type would rarely, if ever, make use of its rough field capability - the Soviets being kind enough not to lay waste to the RAF's runways at any point during the Cold War. 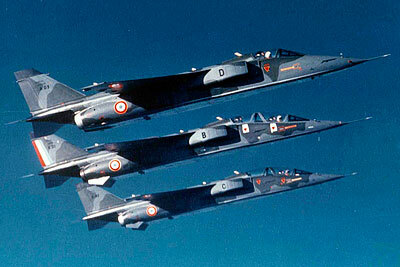 By 1977, the Armée de l'Air had six Jaguar squadrons, most of which were dedicated to nuclear strike or battlefield support; two were dedicated to rapid response to support French interests overseas. The Algerian-backed Polisario forces caused a crisis in Mauritania later that year, with French nationals killed and kidnapped, and Jaguars were deployed to Senegal as part of the French military response. December 1977 saw the first use of the Jaguar in combat, attacking Polisario fuel and ammunition dumps and wreaking havoc with a supply column that was caught out in the open. French Jaguar operations would continue in this area of the world until the 1991, with the Jaguar generally performing impressively in a relatively low-threat environment. As the Polisario gained more modern and effective surface to air missiles, the Jaguar force suffered accordingly and six were lost during the sporadic conflict. 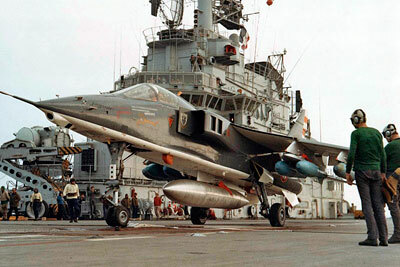 The French also carried out combat operations with their Jaguars during the civil war in Chad from 1983 to 1987; one was shot down and two lost to non-combat accidents. The UK-based trio of 6, 41 and 54 Squadrons at RAF Coltishall were all assigned to NATO's Allied Commander Europe rapid-reaction force, their primary purpose being to reinforce NATO forces as necessary in time of war (most likely in Norway and surrounding areas), with 41 Squadron specialising in recce taskings. The RAF Germany Jaguar squadrons were very much the tip of the spear, with 14 Squadron forming in 1975 to be followed by 17, 31, 20 and II(AC) Squadrons, all being active by 1978. These were all part of NATO's 2nd Allied Tactical Air Force (2 ATAF) and were expected to wreak havoc among Warsaw Pact ground forces if the Cold War went hot. Many of these airframes were wired to carry the WE177 tactical nuclear bomb, though II(AC) were primarily a recce unit. The Jaguar received the first of many upgrades in RAF service from 1981 onwards, with the original NAVWASS (navigation and weapon aiming sub system) replaced by a far more reliable and accurate inertial navigation system in the GR.1A. Improved Adour 104 engines were also rolled out throughout the fleet. However, as the more capable PANAVIA Tornado became available in ever greater numbers during the mid to late 1980s, the RAF Germany Jaguar squadrons were progressively re-equipped with the Tornado, with 20 and 31 Squadrons going in June and October 1984 respectively, 17 and 14 Squadrons in March and November 1985 and finally II(AC) Squadron at the end of 1988. 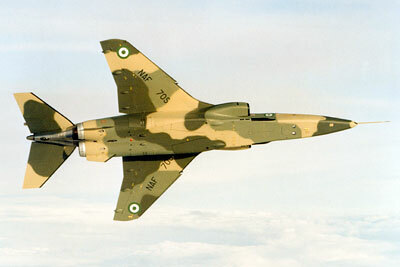 The small Nigerian Jaguar force did not operate for long; despite being the most heavily populated country in Africa and rich in natural resources including oil, chaotic government with repeated coups and corruption on a massive scale coupled with sanctions by other nations left the country's Air Force unable to afford a safe level of operations, or to keep maintenance contracts going. 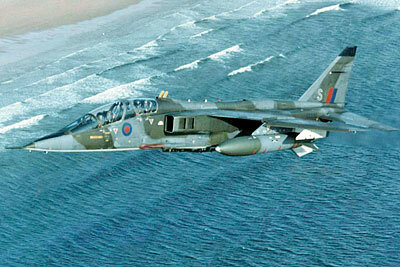 By early 1990 they had flown their last Jaguar, with some not having undergone inspections since 1986. The 14 (or 16?) surviving airframes have been basically derelict ever since and have long since passed the point of being flyable without a huge investment. Several attempts have been made to sell them since, most recently in October 2011 when they were apparently put up for auction. The level of corruption endemic in the country can hardly make a purchase attempt an attractive proposition! Twelve Royal Air Force Jaguars joined their French colleagues in combat during the 1991 Gulf War, known as Operation Granby to the RAF. Sadly one Jaguar was lost during a training sortie prior to the war, with Flt Lt Keith Collister killed when his Jaguar hit a ridge during a low level turn. However, with 617 combat missions and only 7 sorties lost to unserviceability, and no combat losses, the simplicity and maintainability of the design (and the competence of RAF crews!) was dramatically proven. Painted in a temporary 'desert pink' scheme, Jaguars and crews from 6, 41 and 54 Squadrons plus 226 OCU all took part in the war, armed with a variety of weapons including cluster bombs, rocket pods and Sidewinder missiles. With RAF training to this point having been in low-level operations and operations in the Gulf mostly taking place at medium altitudes, the Jaguar force not only had to cope with a short-notice change of tactics but also the use of unfamiliar weapons - Canadian CRV-7 rocket pods and American CBU-87 Rockeye II cluster bombs rather than the Matra pods and BL755s used at low level. Operations were against a mix of targets including land forces, fuel dumps, artillery, SAM and SSM sites and naval vessels; some recce sorties were also flown using both the standard recce pod and also a newer Vinten pod. The French deployed 28 Jaguars during the Gulf War, from a variety of squadrons, yet flew fewer missions than the RAF Jaguar force - 615 sorties in all, against a similar range of targets. French weapons were more varied, including Belouga grenade dispensers, AS.30 missiles, iron bombs, LGBs, rocket launchers and anti-runway rockets. Once again there were no combat losses though one airframe was hit by a SAM and badly damaged, returning home in dismantled form. 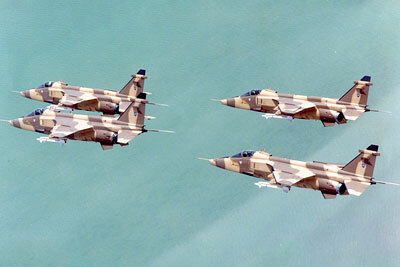 The Jaguar's great rival, the Mirage F.1, was also deployed but saw little use, being relegated to the air defence of Qatar and recce missions, the latter only being permitted in the last few days of the war after an initial ban on their use due to the risk of confusion with Iraqi-operated Mirage F.1s! Despite success in the Gulf, the ending of the Cold War and arrival of the Mirage 2000 was taken by the French as an opportunity to begin drawing down their Jaguar force, with EC 1/7 and EC 3/7 losing their nuclear role in September 1991 and EC 4/11 disbanding in June 1992. French Jaguars continued to be busy, operating over Northern Iraq and also in support of UN operations in the Balkans (and Rwanda) from 1993 onwards. The drawdown continued, however, and EC 1/11 went in July 1994, followed by EC 2/11 a year later and EC 3/11 in June 1997. The final French combat operations were played out in Kosovo in the first half of 1999, and EC 2/7 and 3/7 disbanded in June 2001. The last French frontline Jaguar squadron was EC 1/7, which continued providing a detachment to the Balkans until finally withdrawn from the area in 2004. The squadron hung on until July 1st 2005 before going the way of all the others, bringing an end to French Jaguar operations. 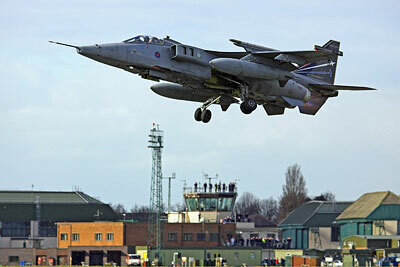 The RAF Jaguar force's success in Granby, by contrast, seems to have begun a re-appraisal of the type within the RAF. With further operations over Northern Iraq (guarding the Kurds) after the war and then deployment in support of UN operations in the former Yugoslavia, it was clear that the type deserved to be better equipped than it had been to date. 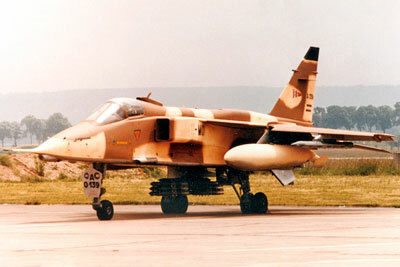 Some of the upgrades received by the Granby jets were rolled out to further airframes, and by 1994 further upgrades were planned including the carriage of TIALD laser designator pods (enabling Jags to self-designate when dropping laser guided bombs) and an improved radar warning receiver. Before these upgrades could be released to the Jaguar fleet, the type was back in action over the Balkans, attacking tanks and airfields. 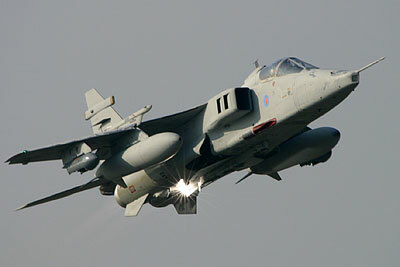 Upgraded Jaguars (GR.1Bs) were deployed to the Balkans in early 1995, and acted as designators for Harrier GR.7s dropping LGBs on Bosnian Serb air defence installations. With intermittent rotations home with Harriers taking over in between, the Jaguar force provided aircraft for Balkan operations until mid 1998. Further upgrades occured - to 'Jaguar 96' and '97' (later GR.3 and GR.3A) standard, which added GPS, an improved HUD, hand controller for TIALD, helmet mounted sight, a new recce pod, datalink, NVG compatibility and finally uprated engines (the initially troublesome Adour 106). From 1997 onwards Jaguars took part in Operations Warden and Resinate over Iraq, with the final such deployment returning home in 2003. The second Gulf War, Operation Telic, was initially to have included Jaguar participation but with Turkey withdrawing permission for the use of its bases, the intended Jaguar deployment was cancelled. The last four Jaguars already in Turkey at the time for Op Resinate duties flew home. September 2003 saw the RAF celebrating 30 years of Jaguar operations in fine style, with 16 Jaguars in diamond formation overflying what had become the true home of the Jaguar - RAF Coltishall. A year later the extensively upgraded and extremely capable Jaguar force was rewarded for over a decade of near-constant operations with the news that the type was to be retired early, with the retirement date set as October 2007. With no plans to base the type's replacement (the Eurofighter Typhoon) at the RAF's only remaining Jaguar base, this would also mean the closure of RAF Coltishall. 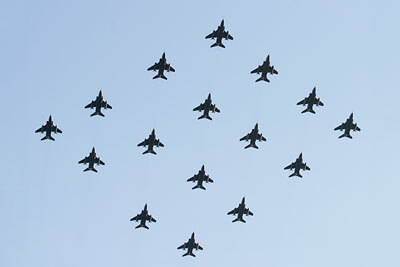 The type's draw-down initially proceeded as planned, with 54 Squadron and 226 OCU/16(R) Squadron disbanding in March 2005, and 41 Squadron following on in March 2006. By this time the decision had been taken to move the final RAF Jaguar squadron (6 Squadron) to RAF Coningsby to permit Coltishall to close earlier. 6 Squadron moved to Coningsby at the beginning of April 2006, and fully intended to continue as a front-line unit until the October 2007 out of service date. However, the MoD disgracefully gave the Squadron notice on 24th April 2007 that they were to cease operations on the 30th April - just 6 days later. With that little notice 6 Squadron still managed to not only deploy 10 Jaguars to Lossiemouth the next day (one final visit to the old stomping grounds! 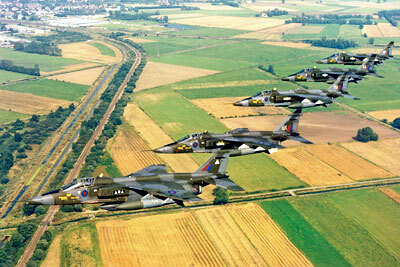 ), but also put up a formation of 12 aircraft in a 'Big 6' on the 30th to mark the end of RAF Jaguar operations. Thankfully some limited flying continued after this date, keeping pilots current while they awaited transition to Typhoon units and plans were made to deliver the Squadron's airframes to RAF Cosford (for ground instructional use). The first wave of the Cosford deliveries happened in May, and at the end of the month the Squadron was to disband. XX725 was given a desert pink scheme in honour of the RAF's first combat use of the type, and was parked on the parade ground for the disbandment parade (at which another formation was flown). Another wave of deliveries arrived at Cosford in June. At the end of the month XX119 was unveiled in a truly fantastic paint scheme showing the Jaguar's spots revealed as if the grey camouflage was peeling off, a fitting and flamboyant end to the type's career. The remaining airframes were flown into RAF Cosford on 2nd July 2007, with XX119 touching down as the last jet in the wave. 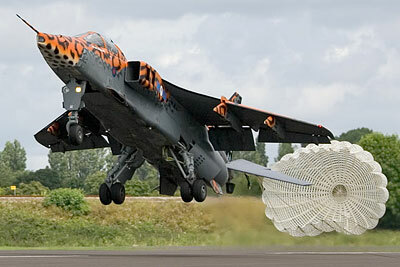 This left just one Jaguar in UK military service, QinetiQ's T.2B XX833, based at Boscombe Down. XX833 continued to fly until later in the year and her final flight was on 20th December 2007, after a quick tour of the UK taking in places with a strong Jaguar link - Coltishall, Coningsby and Warton. The RAF retain a significant number of Jaguars for ground training purposes (including some in taxiing condition), and XX119 was used as a testbed to trial an improved Adour engine intended for the Indians. With 33 years of frontline service and over a decade of combat operations, the "supersonic advanced trainer" certainly provided value for money for the RAF. By 2006, Ecuador's small Jaguar force had also been retired. Their original 12 aircraft (Jaguar Internationals - 2 EB trainers and 10 ES), equipping Escuadron de Combate 2111, were reduced to 9 by 1991, when three attrition replacements were acquired (ex-RAF GR.1s). A further attrition replacement deal in 1993 fell through and by 1997 they were down to 8 airworthy examples and just 6 by 2000. Despite occasional conflicts with Peru, no Ecuadorian Jaguars were lost in combat operations - mostly because the Jaguar force were held back as a strategic asset to carry out deep strike missions should the conflicts escalate. In the 1981 'Protocolo War' conflict, however, there was at least one Jaguar recce sortie carried out deep into Peruvian territory. By 2002 their remaining handful of Jaguars were grounded and kept in ready reserve until 2006 when they were officially retired. By contrast, both Oman and India continued to operate the type after the RAF had retired theirs. Oman initially ordered 12 aircraft, equipping 8 Squadron, and later followed up with a further order to include enough jets for a second squadron (20 Squadron) and some attrition replacements, bringing their total order to 27. Their pair of twin seaters unusually include the RWR normally only carried by the British Jaguar S, but have refuelling probes on the nose as per French examples. Omani Jags saw similar upgrades to RAF examples as part of a programme to extend their life when no suitable replacement could be found; since then the Omanis have purchased a number of F-16s, but continued to operate their Jaguars while they decided on a more modern replacement. With the Eurofighter Typhoon being selected and deliveries due to begin in 2017, the last four flyable Jaguars were withdrawn from service in August 2014 leaving the F-16 as a stopgap replacement. India is now the final user of the type, after an uncertain start. It took BAC more than 10 years to get the Indian Air Force to make their initial order, which was finally signed in late 1978. 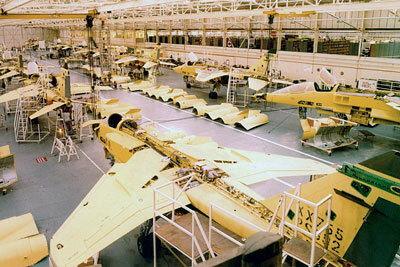 This was a large order for 130 aircraft, 35 to be built in the UK and the remainder to be licence built in India by Hindustan Aeronautics Ltd (HAL). 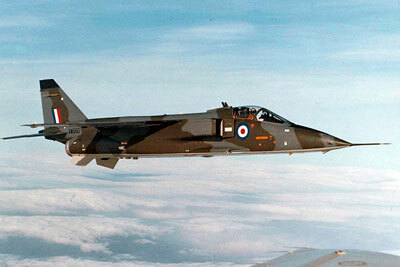 Initial training was also carried out in the UK with the RAF Jaguar OCU. 14 Squadron were the first to form in July 1979, becoming fully operational in September 1980, followed by 5, 16, 6 and 27 Squadrons. The early Indian Jaguar Internationals (or 'Shamsher' as they are named in Indian service) were equipped as per RAF Jaguars, but the unreliable NAVWASS was soon upgraded to the DARIN inertial navigation system. Several aircraft were also upgraded with a French-built Agave radar in the nose and Sea Eagle air-to-surface missile capability for maritime strike purposes. Since then the type has followed a similar upgrade path to the RAF Jaguars, with DARIN II including further improved navigation kit, HUD and MFDs, HOTAS and improved RWR. The radar-equipped Jaguar IMs have had Israeli-built Elta 2032 radars installed also. Combat operations have been limited, with Shamshers taking part in recce sorties during peace keeping operations over Sri Lanka from 1987 to 1990 and a limited number of bombing sorties against invading Pakistani-backed militia in the 1999 Kargil War (Operation Vijay). In common with other types in Indian service the Jaguar has seen unusually high attrition due to various flavours of accident; however it is a well liked type and HAL's continued manufacture of new Jaguars indicates just how useful an asset it is considered to be. It is highly likely that the type's nuclear strike capability has also been an important consideration. In exercises IAF maritime strike Jaguars have even successfully 'sunk' a US aircraft carrier - no mean feat. The latest DARIN III upgrades, currently in progress, include further improvements to navigation including GPS and ILS, and also a better autopilot and data recorder along with the addition of radar to some airframes. Over the years, however, the Shamshers have become heavier and the 'Fat Cat' was identified as needing more powerful engines. An improved Adour (as mentioned above) was trialled but it now looks like India will be buying an entirely new Honeywell engine to upgrade its Jaguar fleet to enable it to fly on well into the next decade. With the Indian Jaguars having now surpassed the RAF's 33 years of service, hopefully they will make it to 40 and - who knows - perhaps even to 50! 1 Oct 1972 28 Mar 1973 Jan 1996? Sep 1998? Two 30mm cannon, up to 10,000lb of bombs or LGBs, rocket pods, WE177 tactical nuclear bomb, AIM-9 Sidewinder missiles, etc. One 30mm cannon, up to 10,000lb of bombs, rocket pods, etc. Two 30mm cannon, up to 10,000lb of bombs or LGBs, rocket pods, AIM-9 Sidewinder missiles, etc. One 30mm cannon, up to 10,000lb of bombs, rocket pods, etc. 1,056 mph ? ? ? 45,930 ft ? ? ? 334 miles (low level) to 2190 miles (ferry) ? ? ? Details for non-RAF versions will be added soon. Externally the various major variants are quite easily distinguished; there are a number of points to look for. French Jaguar As do not have the 'chisel nose' of the RAF and International single seaters, nor do they have the RWR fairing on the fin. French Jaguar Es have a fixed refuelling probe on the tip of the nose; RAF two seaters have a pitot probe in this position. The sole Jaguar M had single mainwheels and double nosewheels rather than the other way round as per all other marks. 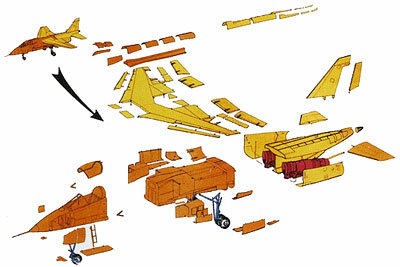 Externally the GR.1 and GR.3 differ only in minor details such as aerial fit; the situation is the same for the T.2 and T.4. Most of the differences are in the cockpits on these variants.